Richtig müsste es “Mamma empfiehlt” heißen (Mamma mit Doppel-M, da es sich hierbei um den Namen des Lokals handelt). 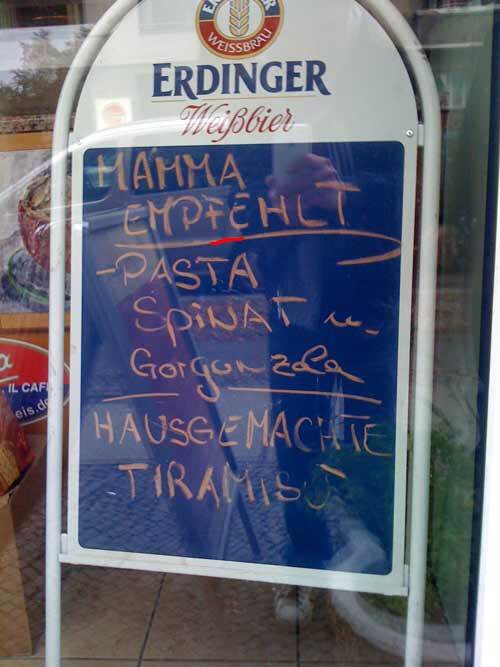 Ach ja: “Tiramisu” ist laut Wörterbuch übrigens ein Nomen im neutrum, weswegen es “HAUSGEMACHTES TIRAMISU” heißen müsste. Doch das stört wohl niemanden mehr, der zuvor verdrückt, was “Mamma empfehlt” hat. My kind of a blog entry definitely, good work on the splendid piece you did on checking the topic down in to solid data. Some time I learn another post currently, and also I am questioning whether or not the woman had written zygor plus the same man. Exactly the same model that we enjoy, perhaps transferred comparable thoughts. Jots down content on some other web-site? Naturally I like your website, but you have to take a look at the spelling on quite a few of your posts. Many of them are rife with spelling problems and I find it very silly to tell you. Nevertheless I will certainly come back again! I love what you guys tend to be up too. This kind of clever work and exposure! Keep up the superb works guys I’ve incorporated you guys to blogroll. An intriguing discussion is couturier comment. I consider that you should write writer on this topic, it might not be a sacred soul but mostly grouping are not sufficiency to communicate on much topics. To the next. Cheers like your Adult web Step into this. despite her lawyers seeking an injunction to prohibit anyone from publishing or disclosing the video. But never one to shy away from controversy, Tulisa has been carrying on with business as usual.